Golder Law is a team of seasoned professionals dedicated to providing its clients with practical, result oriented legal services. We offer each client a common-sense approach to reaching a resolution based on the unique factors of every matter. After a thorough review of the issues, we strive to provide our clients with several practical alternatives to efficiently resolve matters in an attempt to avoid protracted and costly litigation. However, when we resort to litigation, our clients know that they have a team that has been in courts throughout the State of Georgia for over four decades, protecting their rights. We pride ourselves on our accessibility and one of our team members is available to communicate with our clients most any time. Our clients know we are only a phone call or an e-mail away and compliment us for returning their phone calls or responding to their inquiries promptly and efficiently. Mark and Lynn have been working together for over 20 years. Each has extensive knowledge and experience handling sophisticated and complex legal matters as well as simple requests. Golder Law serves a wide variety of clients including individuals, investors, closely-held companies, institutional lenders, community banks and real estate developers. There is a reason that our clientele consists mostly of satisfied clients and the referrals we get from our clients. We are happy to provide references should you wish to contact our clients regarding our practice. Marsha is our legal assistant who has been on our team for almost 18 years. She is involved in every matter that comes into the office. She routinely assists our clients with questions that are not necessary for an attorney to answer. We recognize and appreciate the fact that not every inquiry from a client should be billed. Our clients constantly tell us how much they appreciate her hands-on approach, her knowledge of their matters and her prompt handling of their inquiries. We are small by design and will stay that way. Contact Golder Law to see why we have been satisfying our clients for over 40 years. 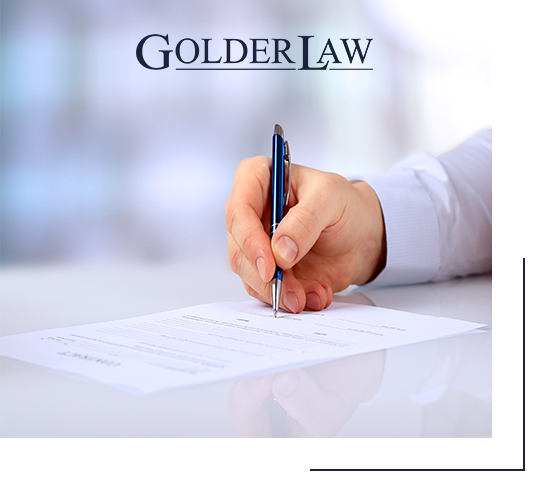 We will gladly answer any questions that you may have to allow you to decide if Golder Law is the right fit for you. We understand that representing you is a privilege that we will never take for granted.